The DC TV universe is dipping into the Glee well once again to cast its lead for its latest superhero TV show. TVLine is reporting that actress Melissa Benoist, best known for playing Marley during Glee’s 4th and 5th season as been cast as Kara Zor-El otherwise known as Supergirl in the upcoming CBS series of the same name. Kara Zor-El escaped her home planet of Krypton amid its destruction years ago. Since arriving on Earth, she has concealed the powers she shares with her famous cousin. But now, at age 24, she decides to embrace her superhuman abilities and be the hero she was always meant to be. I will be honest. I gasped at this news. I am not 100% sure if Benoist is the right actress to pull this part. It is not the fact that she isn’t blonde, I believe I read somewhere that the brunette actress has dyed her hair but acting wise, she didn’t really show her chops off in Glee. I did like Marley as a character but her storylines were like issues of the week type ones and I don’t think she really had a chance to grow. Throughout Benoist’s two seasons on Glee she was sort of was defined by her character’s weight issues and her boring love triangle between her, Jake and Ryder. But I trust Greg Berlanti. When I first heard that Grant Gustin (another Glee alum) was cast as Barry Allen, I thought he too was all wrong, this of course was based on my not liking him as Sebastian. However, as soon as I saw Gustin on Arrow as Barry and now 10 episodes in on The Flash, Gustin IS Barry Allen. 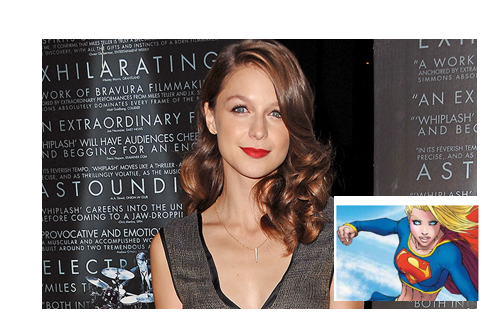 So I have high hopes that Berlanti and company did see something in Benoist to make her their Supergirl. I mean, Benoist has some pretty big boots and cape to fill out after following Laura Vandervoort as Smallville’s Kara/Supergirl. Still to be cast are Kara’s science-minded foster sister, Alex; Cat Grant, the CEO of CatCo, a media conglom Kara toils for; CatCo colleagues James Olsen and Wynn Schott; and Hank Henshaw, the Supergirl-obsessed director of the the DEO (Department of Extra-Normal Operations). And be prepared Melissa Benoist, your life has now completely changed as it has changed Stephen Amell’s and Grant Gustin’s. Also, get ready for Comic Con 2015, which I am glad to say that Pop Goes the World will be going back again and hope we get to see the Pilot. Supergirl is expected to air this fall on CBS with a day and time TBD. And of course, we will be recapping the show.